Smart home cooks keep a special book of magic tricks for dealing with leftovers. While I wouldn't 'plan' it for supper, it's a great way to use leftover beef (as tonight) or something firm-textured like pork that can stand up to the strong-flavored sauce. I've been hanging out with Sweetnicks for a couple days so it's no surprise that the inspiration for this comes from her too. Like all leftover creations, however, it became my own based on what was in the frig and pantry. There's more Leftover Magic in the Recipe Box. Whatever's on hand that sounds good! Stir together the sauce ingredients. Add the salad basics and any additions. 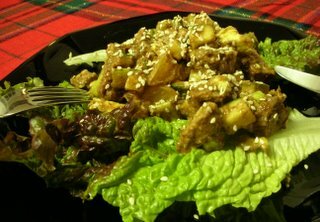 Arrange over greens, sprinkle with sesame seeds. Serve and enjoy!